Here’s a first: a stunning photography book about our least explored room. FLUSH: Celebrating Bathrooms Past & Present is the latest book by photographer Steve Gottlieb, whose previous titles earned major national recognition. When were the first bathrooms built, and where? 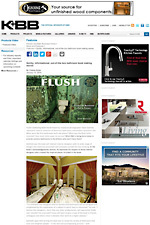 When was the flush toilet invented? When was it popularized? How much toilet paper do we use? What R&D is being done today to provide sanitary bathrooms to the billions who don’t have them? Gottlieb describes FLUSH as “a personal and, admittedly, quirky collection of images, accompanied by my idiosyncratic musings.” The book will appeal to those interested in photography, history, technology, sanitation, interior design…and those who are curious about the room where they spend more than a year of their lives. After perusing FLUSH, readers won’t look at bathrooms in the same way again. Specifications: 136 pages; 94 4-color photos; softcover; 7 ½” h x 9” w (a size suitable for coffee table…or toilet tank). Copies available directly from Privy Publishing or Amazon. Editors: Lowres images may be downloaded (with proper credit) from the “FLUSH Excerpts” pdf posted on our website. Highres images for print publication available on request. Book Reviewers: Reviewer copies available on request. Interviewers and bloggers: Contact us by phone or email. Steve Gottlieb is the photographer/author of the widely acclaimed books, Abandoned America, American Icons and Washington: Portrait of a City. Literally thousands of his photographs—from his books and assignments—have been published worldwide. Gottlieb’s commercial images have been recognized with such awards as "Advertising Photograph of the Year" in both NYC and Washington, D.C. In 2005, Gottlieb founded Horizon Photography Workshops, which American Photo magazine selected as one of the “12 Awesome Travel Workshops in the United States.” (www.horizonworkshops.com) He is a frequent speaker on photography and creative/innovative thinking. A graduate of Columbia University’s College and Law School, Gottlieb practiced law in private firms and the federal government for ten years before turning his photography hobby into a vocation. He is a competitive tennis player who has been ranked #1 in four different age divisions in the Mid-Atlantic region. Father of two grown sons, Gottlieb divides his time between Chesapeake City, MD and Washington, D.C. Please contact us for access to our selected jpegs for press use only. "Best in Show" —Chicago Book and Media Fair. • The photos in FLUSH we taken in 23 states and two foreign countries. The first photos were taken 28 years ago, but most were taken during the past two years. • During my photography presentations, I sometimes showed a few bathroom photos; I also posted a few framed bathroom prints in my photo workshop bathroom. 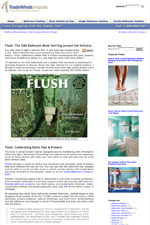 The positive reaction—plus the fact that no one had ever done a book like FLUSH—gave me the idea to create a book. As to why no photographer before me has done a book on bathrooms I don't know, but surely one reason is the social stigma around the subject matter. Another might be a belief—a mistaken belief—that the subject isn’t interesting or varied enough for a photography book. • Most locations were found through recommendations of people who attended my photography talks and workshops. People don’t generally talk about bathrooms much, but they clearly make an impression. • People with unusual bathrooms are—no surprise—proud of them and delighted when someone is a serious admirer. The few rejections I suffered were from companies that had a restrictive policy about any photography on their premises. • I practiced law for a decade and never found the work satisfying. In 1985, a publisher published a book of my (amateur) photographs, Washington: Portrait of a City. This book was the springboard that enabled me to quit lawyering and become a professional photographer. I’ve never looked back. FLUSH is my fifth book. I have written the text for my books and designed them, too; FLUSH was specifically designed to fit comfortably—both in its physical dimension and its visual aesthetic—on coffee tables…or toilet tanks. • The more one learns about bathrooms, the clearer it becomes how advances in toilet/bathroom technology have been highly erratic. Good ideas are developed but often not implemented for decades…even centuries. • FLUSH Specifications: 136 pages; 92 (4)color photos; 7.5” (h) x 9” (w); softcover; $17.50; available on Feb. 15, 2014. Purchases in advance of publication date can be made on Amazon or through this website. • What’s next for Steve Gottlieb? A sequel to FLUSH, I hope. That would surely make me the only professional photographer in the world who wants his career—and his future—to be in the toilet. that exist and enlighten people..."
"The book will appeal to those interested in photography, history, technology, sanitation, interior design." 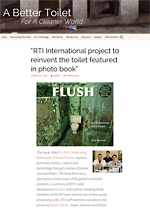 "The book features a description of the scope of the global sanitation problem, a summary of RTI’s toilet development project and a photo showing three members of the RTI team behind one of their waste processing units." "At first, bathrooms didn't seem like like a subject worth an entire book, but Gottlieb was quick to discover how everyone, no matter how sophisticated, has highly developed bathroom sensitivity." shifts in history that have affected the way we live."